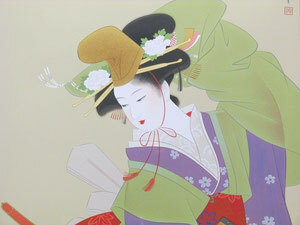 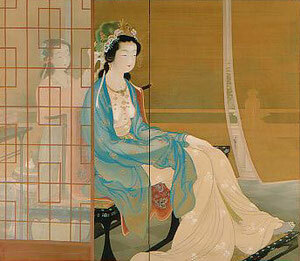 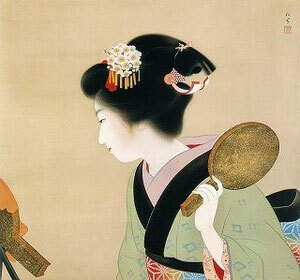 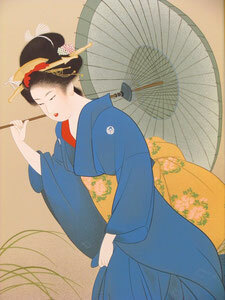 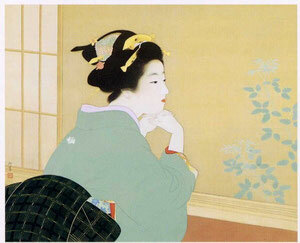 Shoen Uemura (1875-1949), a master artist, who depicted woment of great beauty. Shoen Uemura (1875-1949) painted without exception women of great beauty. 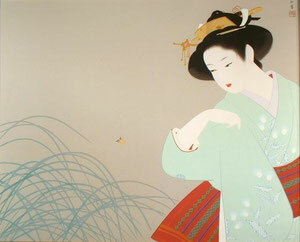 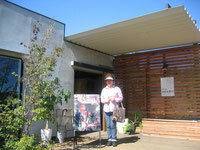 As a part of highlighting painters that I adore, I have picked Uemura this time. 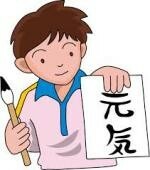 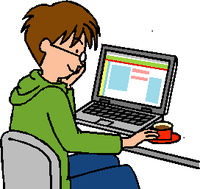 Now, let me show you a good example of her works. 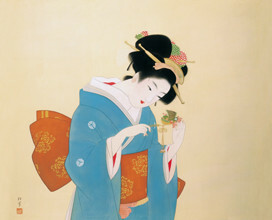 Painted in 1936, showing a model performing a traditional dance. 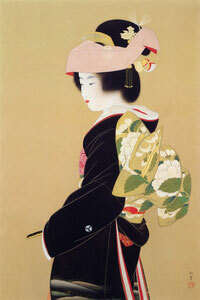 The model happened to be the wife of Uemura’s son when she was a maiden. 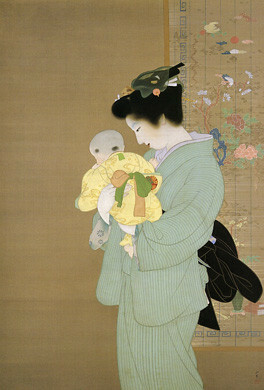 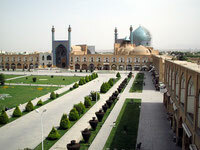 This work is registered as an “important national treasure”. 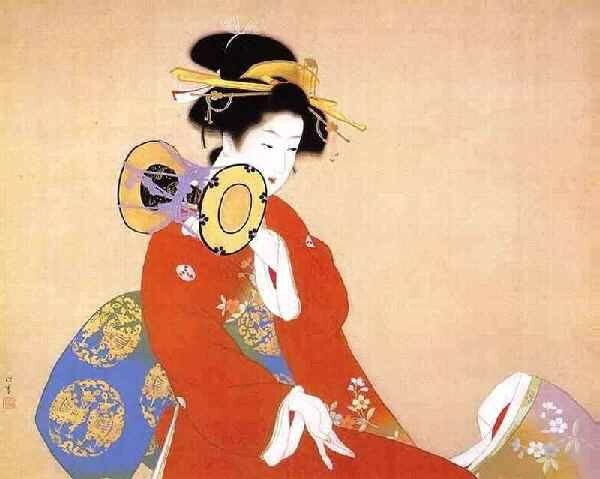 Uemura always painted Japanese women, with the exception of “Yang GuiFei”, a Chinese woman noted for her beauty who lived in the 8th Century (the Tang Dynasty). 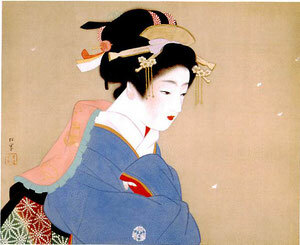 There are distinctive features to these women: graceful and aesthetic, doll-like and meticulous, gentle and delicate, static and calm. 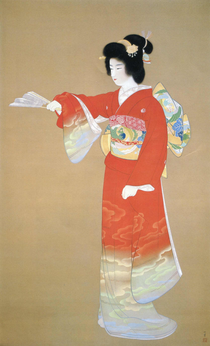 The paints that Uemura used were basically traditional non-oil paints that gave subdued colors best suited for her works: india ink, powdered rock paints, natural coloring, powdered shell-fish (white) paints. It’s interesting to note that both her son (1902-2001) and a grandson (1933- ) became painters also but their works seemed to focus on natural landscapes, perhaps avoiding women of great beauty for whatever reasons they might be. 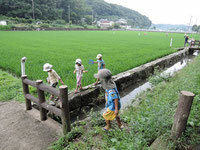 In the Tokyo area, you can marvel at some of Uemura’s works at the Tokyo National Museum of Modern Art located in Chiyoda-ward, Yamatane Museum of Art located in Shibuya-ward, and at Tokyo University of the Arts located in Taito-ward. Shoen Uemura was born and lived in Kyoto.